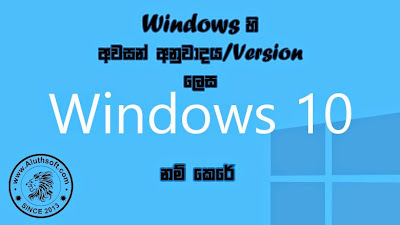 Microsoft Windows 10 කියන්නේ මොකද්ද කියලා ඉතින් කට්ටිය දන්නවනේ. අද Microsoft ආයතනය Confirm කරල තියනවා Microsoft Windows 10 කියන්නේ Windows හි අවසාන අනුවාදය ලෙස. ඒ කියන්නේ අන්තිම Version එක. ආය Windows 11 කියල මොකුත් නැ කියල තමා කියන්නේ. Windows 10 මේ අගෝස්තු විතර වෙද්දී එනවා. ඊට පස්සේ ආය නැ. Microsoft ආයතනයෙහි Nixon කියන පොර තමා මෙහෙම කියල තියෙන්නේ. "Right now we're releasing Windows 10, and because Windows 10 is the last version of Windows, we're all still working on Windows 10,"
මේක පිටිපස්සේ ලොකු කතාවක් තියනවා. Microsoft කාරය කියන්නේ උනුත් Apple Mac OS වල වගේ system එකක් හදන්ඩ යන්නේ කියල. ඒ කියන්නේ මෙහෙමයි. Apple Mac OS පටන් ගත්තෙත් OS X ලෙස & තාම තියෙන්නෙත් OS X කියලයි. එත් උන් කාලෙන් කාලෙට අලුත් වැඩ කෑලිත් එක්ක Update Release කරනවා පොඩි නමක් එක්ක. හරියට නිකන් Android වල එකෙක Version වලට නමක් තියෙන්නේ . අන්න ඒ වගේ කරන්ඩ තම Microsoft කාරය හදන්නේ. අවුරුදු ගානකට පස්සේ ලොකු OS එකක් release කරනවට වඩා Regular Update release කරන එක හොද හින්ද මේක කරන්ඩ Microsoft ආයතනය තීරණය කරල තියනවා. කවදා ඉදන්ද මේක කරන්නේ කියල නං තාම කියල නැ. එත් Windows 10 release කරාට පස්සේ එක කරනවා කියලා තමා කියන්නේ. ඔබේ අදහසුත් පහලින් Comment කරලම යන්න හොදේ.